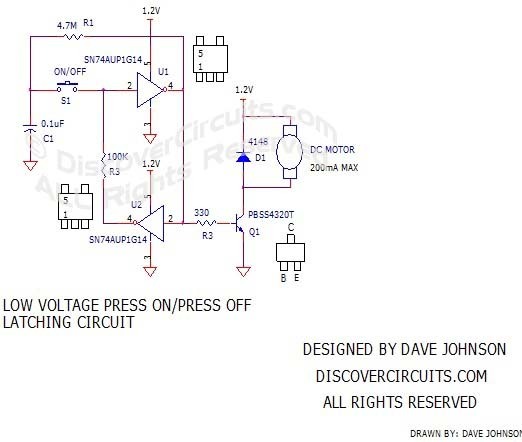 Circuit: #391Low Voltage Press On/Press Off Latching Circuitdesigned by David A. Johnson, P.E. battery cell. Texas Instruments comes to the rescue with their family of low voltage single gate ICs. Specifically the SN74AUP1Q14 Schmitt trigger inverter will operate down to 0.8v and lower. When used with a good NPN transistor, the circuit below works quite nicely. With each press of a small pushbutton switch, the circuit will latch in either the on or off state. When on, the output turns on NPN transistor which has a high gain and a very low saturation voltage. The transistor can handle a higher current than needed by the motor but I would suggest liming the current to about 200ma.